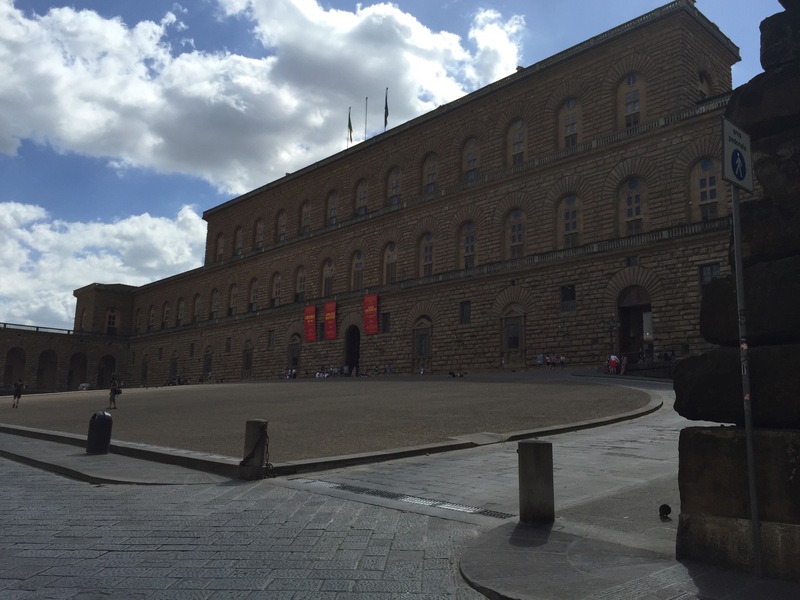 Naples’ Palazzo Pitti is the other enormous, masterpiece-stuffed museum in Florence, or rather, set of museums jammed into a Renaissance palace that, in addition to having many stone staircases inside to climb, is on top of a hill. To the weary tourist, it is truly a place without pity. But I went to visit, in search of Pontius Pilate. 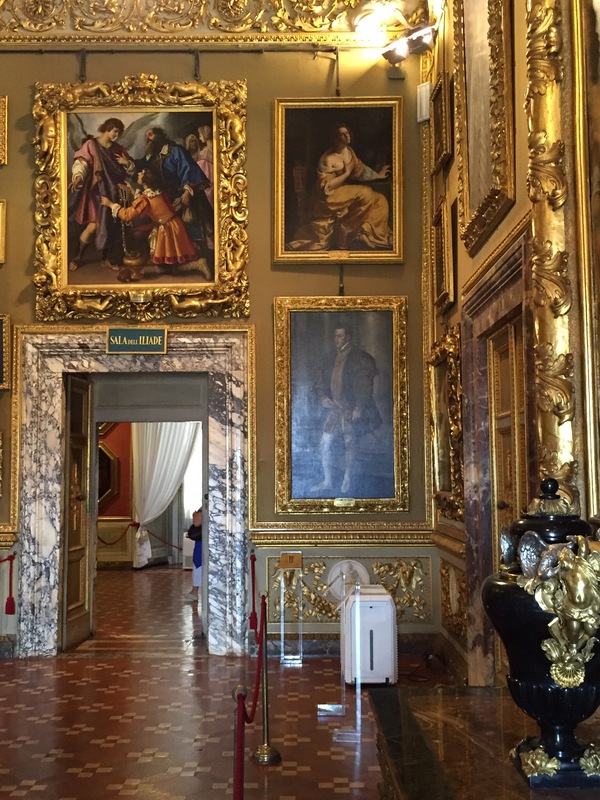 Later in the day I would make my way in and out of the (boring) royal apartments over into the Palatine Gallery and wander awestruck through room after room of fifteenth, sixteenth, seventeenth century paintings by the likes of Titian, Tintoretto, Veronese, Raphael, etc., etc. 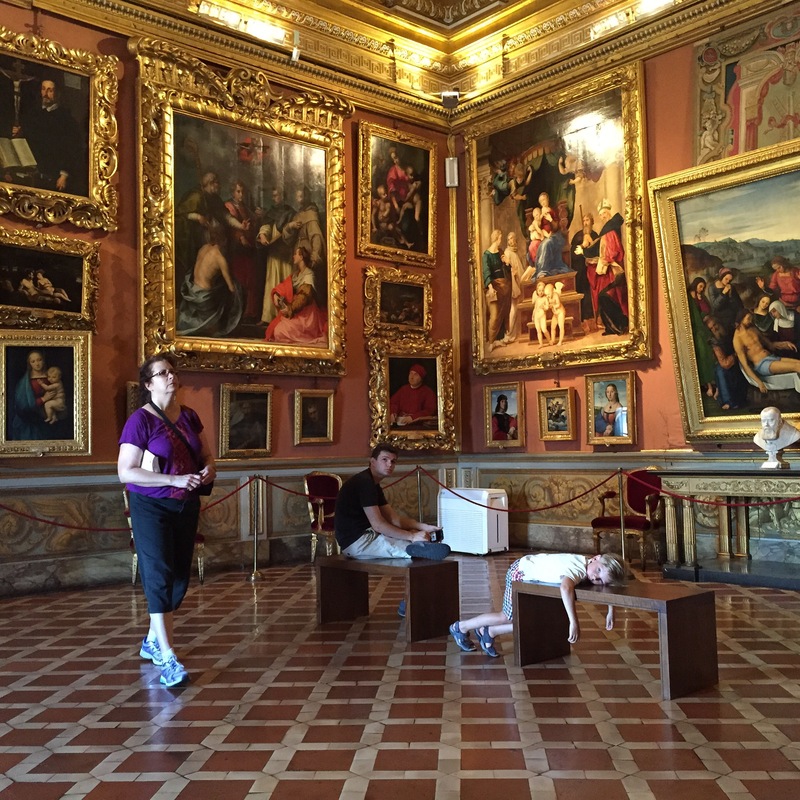 The floors are hard on the feet, and the neck hurts from straining to look at even the exquisitely painted ceilings. The sheer volume of artwork here is overwhelming, and one grows numb to it. 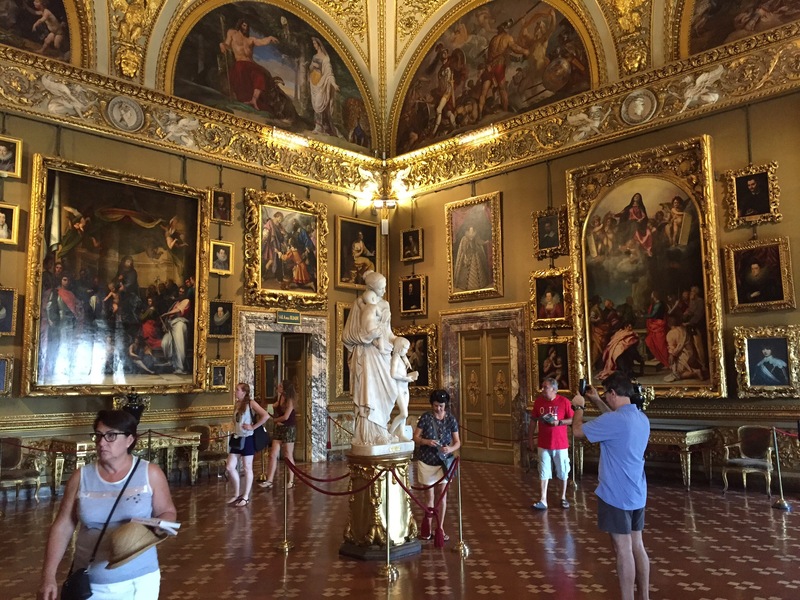 Even the Raphael of Count Tomasso Inghirami one sees in the background below could move me, though I was a little agitated by the placard saying this version is the real one, not the one in the Gardner Museum in Boston! Still, by the end of it all, I felt like the kid below did, splayed out on a bench like the Deposition of Christ behind him. 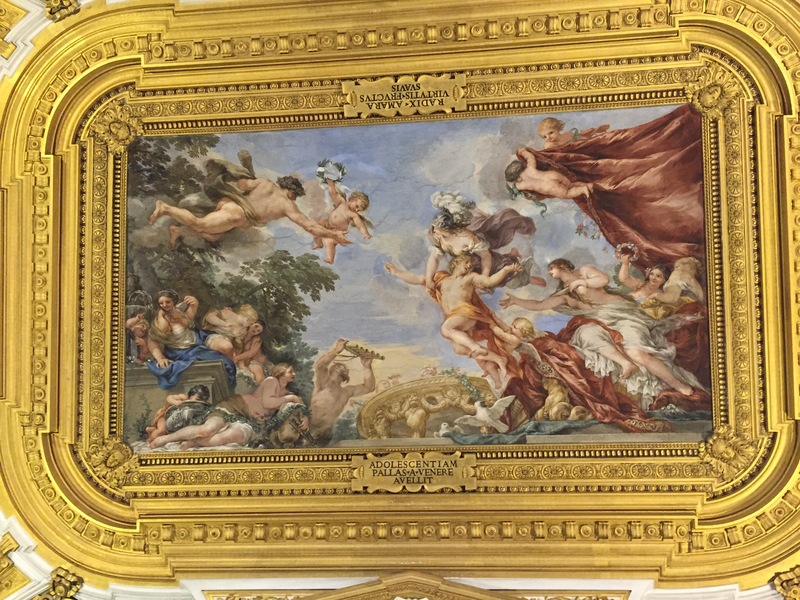 One such ceiling painting. At the top it reads, “The bitter root of Virtue [produces] sweet fruit”; At the bottom, “Pallas plucks Youth from Venus.” The youth looks very unhappy. But, as I said, I’d come to find Pilate, and I did find him, in one of the rooms of the Gallery of Modern Art. 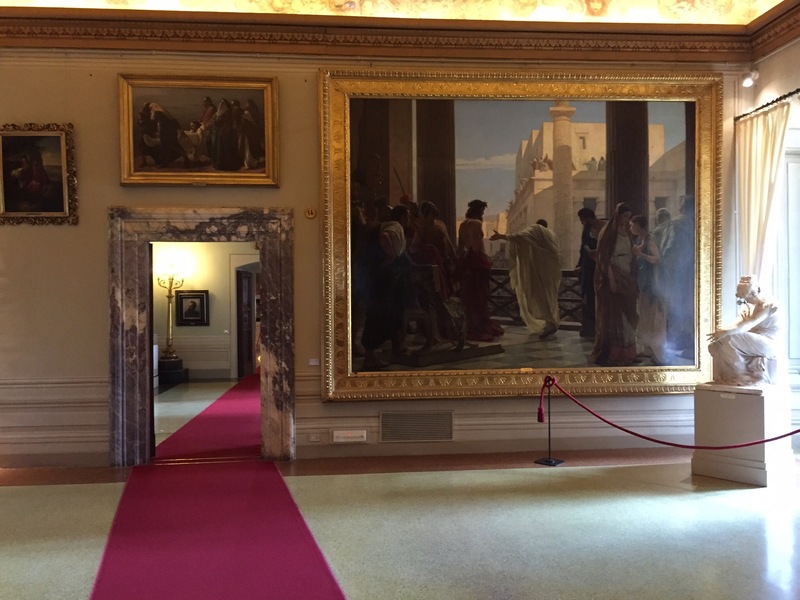 Only in Florence, of course, could eighteenth and nineteenth century artwork be considered modern! It’s a lovely museum, though too crammed as well, to be sure. 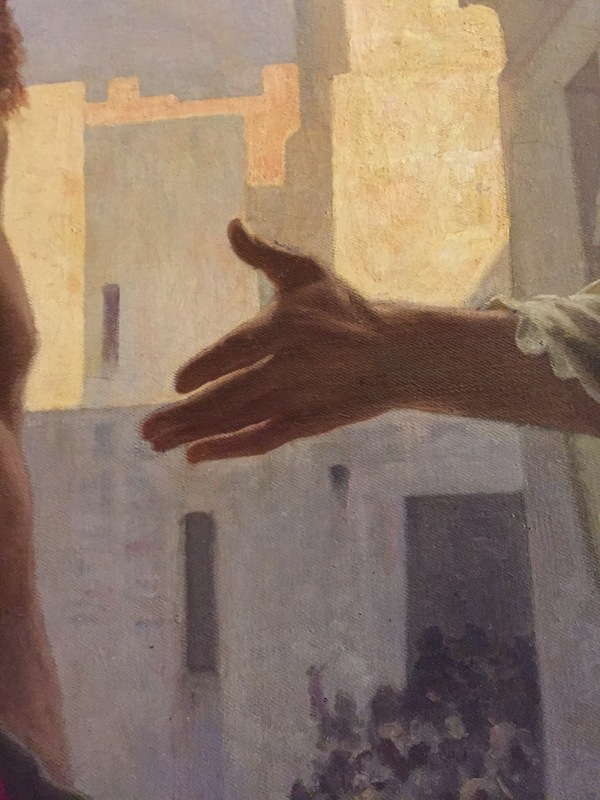 I spent the better part of an hour looking at many minor masterpieces in this gallery before I came upon it, in the corner of a well-appointed room, Antonio Ciseri’s Ecce Homo, from 1871. It’s a much reproduced work, as you can imagine. 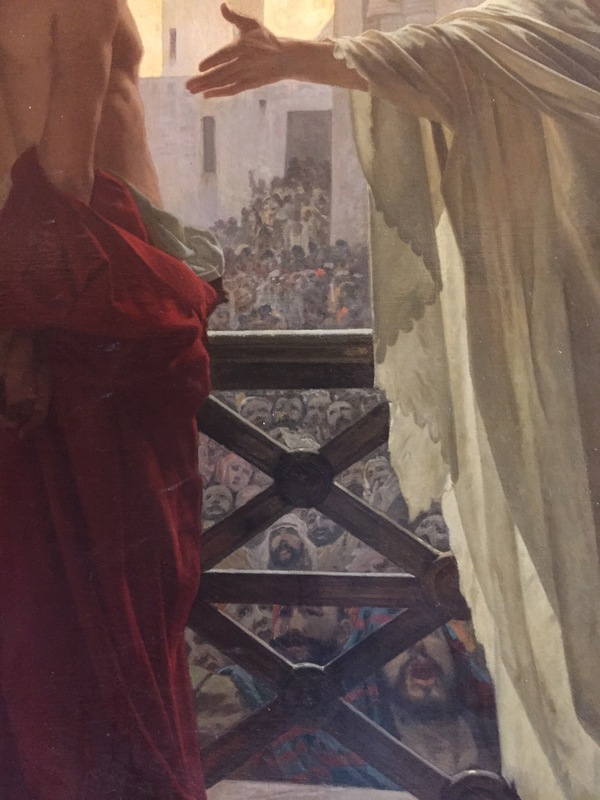 The dramatic point of view, “backstage” if you will, at the presentation of Christ to the jeering crowd, features in many a work about the Passion and Pilate’s particular place in it. I wanted to have a closer look at it, and I’m glad I did. 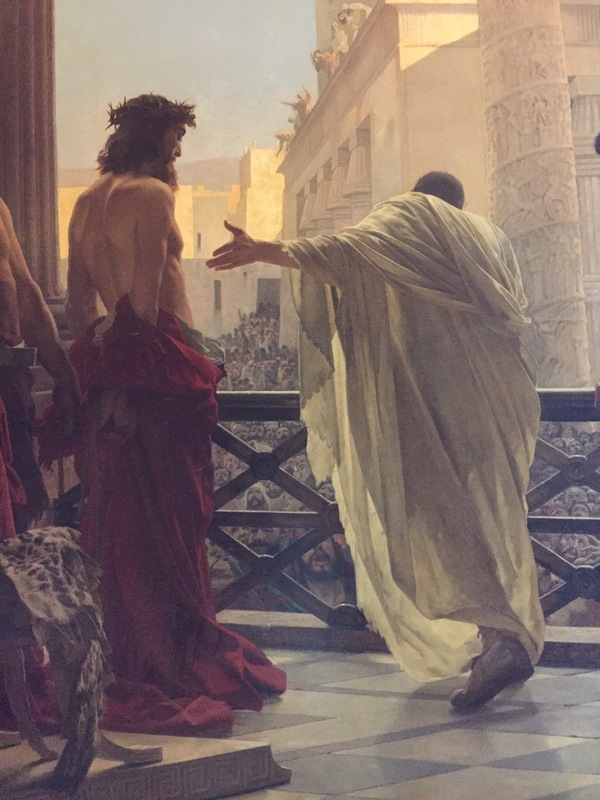 Only later would it occur to me, in Rome at the Scala Sancta, that Pilate stands at the top of the Praetorium steps, those stairs that probably are not in Rome but certainly have been revered as being so. It’s a dated approach, but perhaps the right starting point to a deeper consideration of Ciseri’s magnum opus. This entry was posted in Bible, Boston, Classics, Drama, Florence, Italy, Poetry, Scotland. Bookmark the permalink. I know it’s not the focus of your post, and I can imagine how exhausting this museum was, but it was a pleasure for me to see Artemisia Gentileschi’s Magdalene in the corner of your second photo. 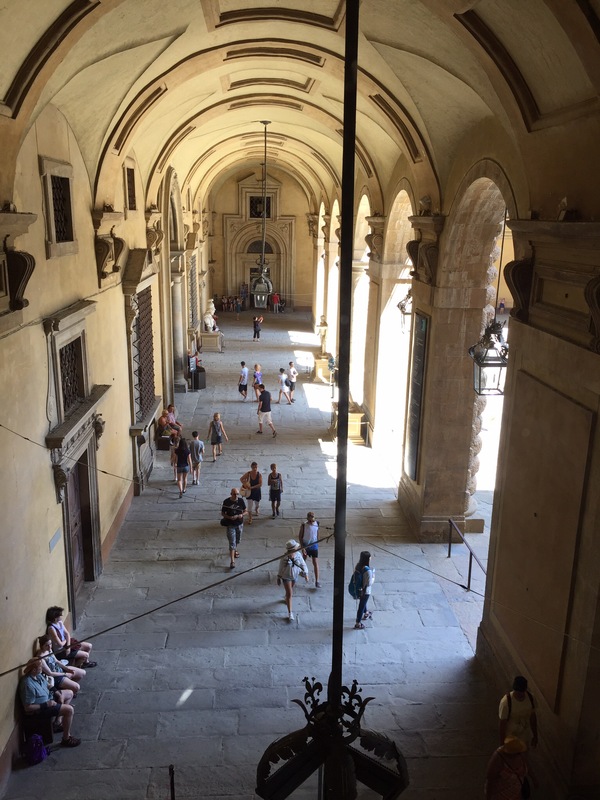 I have very much enjoyed your posts and photos all summer–thanks for sharing! Oh, I know. I loved coming across the Artemisia there, too. IN an earlier version of this post, I mentioned it–alas, that post somehow disappeared before I get it loaded. Thanks so much for your kind words and for reading all these disconnected thoughts. I would like to know if I could use your photo of Ciseri’s Ecce Homo for a short video. It would help to relate the scale of the painting by showing it in the gallery. Here’s a link to a sample of the videos I produce. I would give you photo credit in the description area below the video.